ATV Tire Sealant - Reviews and Best Buys. ATV Tire Sealant - Buyer's Guide. ATV tire sealant has become a hot topic lately. There seems to be a lot of confusion and misinformation that needs to be cleared up. We thought the best way to do that was with this Buyer's Guide. We hope your ATV tires don't look like the one in the picture, but just in case, read on! If you'd like to shop right now, just use this link. Two Types of ATV Tire Sealant. 1. Aerosol can - This is the type most commonly found in auto parts stores and roadside convenience stores. This would be the type we don't recommend for several reasons. The pressurized cans tend to use flammable material as the propellant. Corrosion of aluminum wheels is a possible long term side effect. Difficult and messy clean up after use. Standard size can won't inflate ATV tire. Classified as a hazardous material. Unreliable delivery system. Cans are prone to failure. Effective on only small punctures. Tire sealant guide, reviews, and best buys. 2. Non-aerosol and non-pressurized - Otherwise known as "The Right Stuff". This is why we like it. Not corrosive to aluminum or steel wheels. Available in one gallon containers at discounted price. (Enough for 4 ATV tires). Polymer technology will repair punctures up to 1/2" in diameter. We've learned over the years that when there is a debate about what's best - ask the pros. In this case we looked at what trucking companies, construction companies, and fleet operators use. No contest - it was the polymer based non-aerosol stuff all the way. 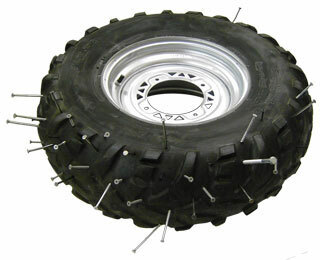 An ATV tire sealant needs the ability to plug fairly large diameter holes in both the tread and sidewall. The stuff that comes in the spray cans just won't do this. So even though there are two types of tire sealant - there's really only one choice for us ATV riders. The type we recommend uses polymer fibers in a liquid gel carrier. It's injected into the tire through the valve stem or by breaking the bead and pouring directly into the inside of the tire. Some sealants use other material like rubber particles to compliment the fibers. The tire sealant is spread evenly along the inside of the tire providing a coating. When a puncture occurs - air pressure forces the ATV tire sealant into the hole and as more polymer fibers are forced into the puncture - the hole is sealed. The entire process usually takes less than two seconds, so very little air is lost. A minimal loss of air pressure can happen, but not usually enough to effect an ATV tire. Check out the video for a visual explanation. This is not an endorsement of this particular product - most polymer sealants work similarly. How Much Sealant Do I Need for an ATV Tire? Good question. How many tires do you want to protect and how much do you like to save money? Most ATV tires will require at least 32 oz. of sealant. That can get expensive if you're buying it by the bottle. Our best buy recommendation is to get the one gallon container if you only have four tires to seal. If you have more than one ATV or have a group that you ride with that might want to go in together to split the cost - most companies offer a five gallon container for even more savings. Another great benefit to getting the larger size containers is that they usually include a pump for injecting the tire sealant through the valve stem. That's a lot easier than trying to squeeze it in by hand - trust us! Click on the custom link below for the best deals online.